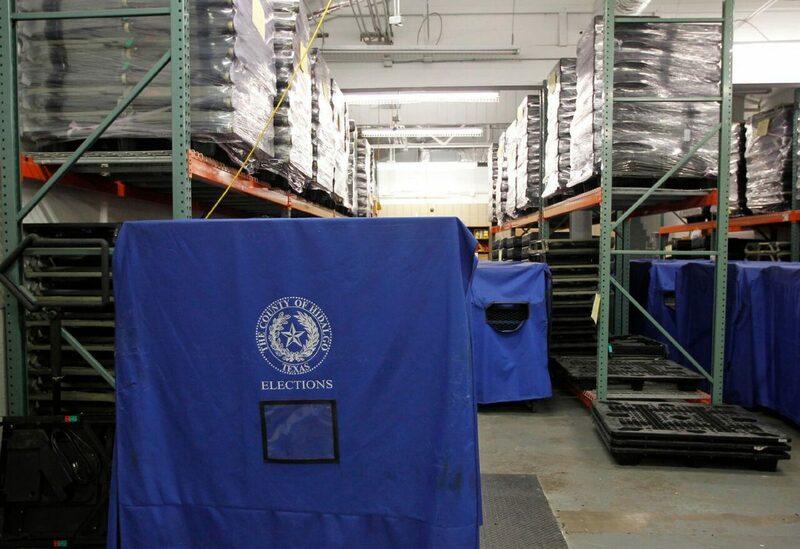 Voting machines are stored in a warehouse on Tuesday, April 5, 2016 at the Hidalgo County Election's Office Annex in Edinburg. EDINBURG — The school board here voted Tuesday to purchase electronic voting machines at a cost of $374,643 to run the upcoming Nov. 6 election in-house. The move was discussed at previous meetings with the board split due to the purchase of the equipment alone being more than five times more expensive than the usual contract with the Hidalgo County Elections Department, which would have been about $65,000 in total. The Edinburg school district board approved the purchase of 58 voting machines and 20 electronic polls using local funds from Elections Systems & Software. The 4-2 vote came after a brief discussion, with trustees Miguel Farias and Ellie Torres voting against it. The total cost of the election would be about $436,059, based on previous presentations. This includes an estimated $61,416 to cover payroll costs and supplies, which will be a recurring cost to the district even after owning the machines. As far as the life of the machines, the company supports the equipment for as long as an entity decides to use it, according to Chris Moody, ES&S director of Texas sales and operations. “We have equipment around the nation that has been supported for almost 30 years now,” Moody said. Torres and Farias were the only two trustees who expressed concerns mainly focused on cost and efficiency in comparison to the county’s cost. During a meeting on April 10, there was talk of bringing county officials to present their product before putting the item up for vote. This presentation never happened since the item wasn’t discussed in a regular meeting until Tuesday. “Doesn’t make any sense to me that here we are having an $11 million budget cut, but yet we are going to go ahead and spend an extra half-a-million on this when we can go ahead and have the county do it at $65,000 or $75,000,” Farias said before Tuesday’s vote. Farias said one of his biggest concerns is that while the county offers 19 permanent locations where people can vote during early voting and Election Day, the plan to conduct the election in-house only includes two permanent polling locations while changing venues the rest of the time. The plan as presented by Mario Salinas, assistant superintendent of support services, would be to make voting available at all Edinburg school district campuses by opening four schools per day as voting sites for 12 days during early voting. During Election Day, Salinas explained, the district would have to match its voting locations to those of the county, which in the past amounted to 19 locations within the city of Edinburg. Having rotating locations for most of the election was a matter contested as both beneficial and harmful to voters. Trustee Juan “Sonny” Palacios, who was not present during the vote despite fiercely advocating for the purchase during the April 10 meeting, said having more locations could encourage residents to vote. “We want to make the election as accessible as possible and as fair as possible, and if we have the opportunity to do so then I believe we should do so,” Palacios said at that meeting. Moving the polling sites daily would be beneficial for constituents in areas not usually reached by polling sites. “Having the early voting sites at those campuses is pretty much bringing the machines to them.” he added. Palacios is one of four trustees whose term is set to expire this year and might be on the ballot if re-election is sought, alongside Oscar Salinas and Xavier Salinas, who also voted in favor of the item. Torres’ seat will also be up for grabs. Teachers voiced their concerns before the controversial vote. Michael Balderas, president of the local Association of Texas Professional Educators, asked for the board to leave politics outside of the campuses and find better ways to spend this money. Tony Mercado, who teaches Social Studies, said that if voter fraud is a concern amid recent arrests of individuals accused of registering and voting illegally, the board should let the appropriate authorities investigate and for due process to take its course and remain focused on education rather than politics. This article was modified to correctly attribute ending quote to Edinburg school district Teacher Tony Mercado.